Jason Torchinsky tried to import a Polish automobile; he got this instead, Ulak-Tartysh, a video game about the Central Asian sport of buzkashi, in which polo is played with the headless body of a goat. 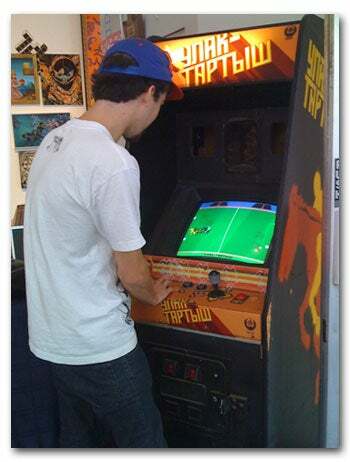 Torchinsky, the guy who built a gigantic functional Atari joystick for the I Am 8-Bit art expo, breaks down the cabinet's hardware and Ulak-Tartysh's gameplay. The game hails from Kyrgyzstan, and is a combination of weird, hilarious and fascinating. This one appears to have been built in 1983, at some state-run electronics factory in the city of Mailuu-Suu. The coin slots say "15 Kopeks," but I think at that time all the USSR satellite states used that denomination. [...] It's based on what appears to be a KR1858VM1 chip, which was a copy of the Z80. Most of the other chips are TTL logic ones, with very little large-scale integration. The video seems to be about 148x116 (?) with what I think are 8 colors. The graphics have that really satisfying gigantic-pixel look, but I think are pretty nicely rendered, considering. I got it here as a strange sort of compensation when a warehouse owner in Poland was unable to ship the Fiat like we had agreed; apparently, this machine was just sitting, forgotten, in a corner of the warehouse. To restore it, I cleaned up the case, and replaced the power supply system with a cobbled-together 110V unit, from the 220V it originally had. I've made repairs, and had to replace the screen/CRT, but beyond that it's as I got it. I left the case in its battered state, but the marquee cleaned up surprisingly well. I'm not sure of what all the words mean, but via an online Kyrgz dictionary, it seems the TAPT button means "grab" or something similar, and I think it says "GOOD!" (pronounced "Djackshi?) when you get a goal.